8213(4). 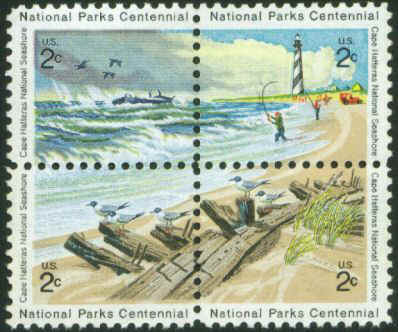 Block of 4 National Parks Centennial series commemorative stamps. Block shows a view down the beach toward the lighthouse at Cape Hatteras. Four stamps, 2c denominations, unused, 1972 issue. Scott #’s 1448, 1449, 1450, 1451. (M). $1.50. 11218. American Tobacco Company, Lighthouse Series Cigarette Cards c.1910. 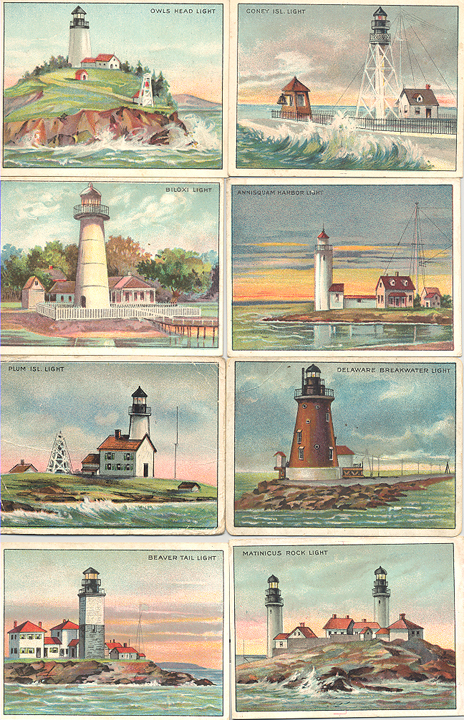 In 1910 in England , Hassan Cigarettes issued this very rare series of fifty cigarette cards depicting fifty different light stations of the United States . Cards include a short history and description of each station on verso. A collection of the 50 original cards is exceptionally difficult to find and would sell for about $280. 2 ½” x 3 ¼”. These individual cards are just what you need to start or complete your set. Many available, please email your wants. $2 each. L. Sitgreaves, Corp. of Engineers. First: U.S. Lighthouse Establishment, complete hand written specifications for the construction of the light-house tower to be constructed at Milwaukie, c.1853. This rare document is entirely hand-written, is comprised of twelve (12), 8 ½" x 13" pages. Specifications include sections relating to General Description, Foundations, Brickwork, Mortar, Tower Room Doors, Floor Plates, Sheeting, Closet Door, Lantern Deck, Step Ladder, Ventillators, Lantern Floor Plates, Scuttle Door, Deck Plates, Railing, Lantern, Lantern Door, Dome, Windows, Stairs and Railing. This is a most interesting and rare document, which gives an unprecedented look at the construction of light towers and particularly the lantern. Document consists of 12 pages as originally folded, overall exceptionally clean and bright, with some original hand written changes and corrections. Text is quite clear and legible and easily readable. A most interesting and important early document. Second: Original hand drawn architectural drawing on linen entitled: Proposed Plan of a Lantern for a Beacon Light at Milwaukie. Large 13 ½" x 23 ½" drawing is done in three colors and includes a detailed half elevation view and a half sectional view of the lantern, scale 1 inch = 1 foot. Drawing is exceptionally clean, bright as if it were drawn yesterday and bears original folds. Third: Original hand drawn architectural drawing on linen entitled: Inverted Plan of Lower Sash Ring showing the manner of connecting two segments.. Large 23" x 35" drawing is done in black and includes seven views of various sections of the sash ring, drawn full size. Again, the drawing is exceptionally clean, bright as if it were drawn yesterday and bears original folds. An unprecedented look at the construction of light-house lanterns and towers!